As well as our Vicar, the staff, Churchwardens and the Parochial Church Council, there are lots of people involved at St. James' since we believe that every member of our church has been gifted in a special way to help build up the body of Christ. A lot of people work very hard to ensure everything we do runs smoothly. A lot of things revolve around food! 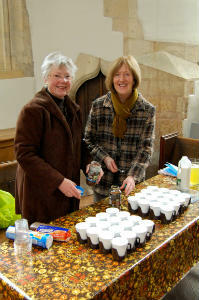 There are the tea and coffee makers who serve refreshments between our 9.30am and 11.00am services and our 'super' cooks who cater for all sorts of church events. There are also those who Welcome everyone to our services and of course those who read our Bible readings and who lead our intercessions. And some people are more technical and run our PowerPoint too! Whatever your skills we can almost certainly use them! On these sub-pages you can see a few of those involved but there are many, many more behind the scenes faithfully doing all those things which keep everything running smoothly.